Home → Blog → INSTAGRAM POLLS: fresh content ideas and more! In the digital marketing era, with more and more people active on social media it’s important how your business uses online communication channels like Instagram, Pinterest, etc. to build brand awareness, get more leads, increase customer retention and improve overall customer experience. As a matter of acts, engaging with people online can be actually your most effective way into your customers world; therefore, to show your audience who you are and what you have to offer, you need to delight them with high quality and compelling content on social media. It’s also true that day after day you may find yourself struggling to find fresh content to engage with your audience. That’s one reason Instagram polls feature has been recently introduced into Instagram stories. This is a tremendous feature that actually may help you in multiple ways because it allows you to poll your audience and see real time results. Do you need to gather ideas for new content? Do you need to see what are the preferences regarding products your about to launch? Do you need to grow your mailing list? Do you need to understand your audience feelings? Then Instagram polls are a great expedient for you!!! Let’s see how to create Instagram polls and how they work. 1) To create an Instagram poll, tap on the Story Icon of your account and insert a picture. 2) Then tap on the Sticker icon (the square with the smiling face) at the top of the Story screen. 3) Select then the Poll Sticker option. 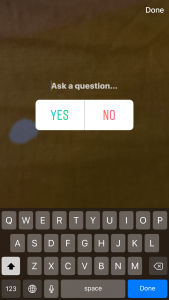 4) Type in the question you want to ask in the text field of your Instagram poll. 5) To customize your Instagram poll responses, tap in each box (yes or no) then type in the response of your choice. You can enter any text up to 26 characters for each option in the poll but you’re limited to two response options. 6) When you’ve finished customizing your Instagram poll, tap either on the checkmark or Done button in the top-right corner of the screen. The poll sticker will center on the screen of your story. 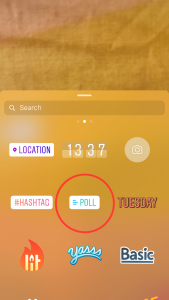 As with any other Instagram sticker, you can drag the poll around the screen for placement and pinch to make the poll sticker larger or smaller. 7) Complete your story post and add it to your Instagram stories as you would any other post. Viewers scrolling through your stories will see the post and be able to vote on their choice. 1) “Yes or No” questions poll: The logic behind this type of poll is to show to your audience that you care about what they think and you want to value your brand by listening to their opinions. Entering yes or no questions to your Instagram poll is the easiest way to draw followers attention to your brand and even more. As a matter of acts, from yes or no polls you can also get an immediate idea of what people like or don’t like so you can accordingly arrange your content on social media. Let’s pretend that you own a Record Company and you want to write an article about the violin. Well, before you do it it may be helpful to learn if people like that particular instrument. You may want to keep these polls light hearted so your Instagram followers are more willing to respond. For instance, you can turn a ‘yes’ into a ‘YASSS/WOW’ and a ‘no’ into a ‘NO WAY/ NOPE!!!.. 2) “Option 1 vs Option 2”: This is a great way to find ideas for your new products or services. Let’s pretend again that you own a Record Company and you want to find out which is the favorite artist before you launch a new classical music record. 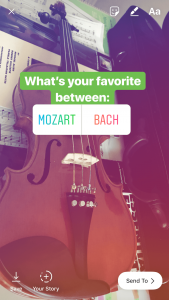 In this situation you may want to put two options together on your Instagram poll. 3) Get audience feedback on locations/feelings: This is a great way to get more insight into who your audience actually is. You could poll about locations, their feelings about certain things and more. 4) Grow your mailing list: If you’ve already an engaged Instagram Stories audience, this could be a good option for you to consider. You can ask questions such as “Can I email you with…YES or NO?” or “Can I email to help you with..YES or NO. ?” The people that answer YES, you can send them a message and ask for their email address. 5) Add an interactive element to bring more exposure to your Instagram poll: When you create an Instagram poll, you can combine it with a location sticker or a hashtag, both of which can drive even more engagement. Whereas at first you could only share Instagram Stories with your own followers, stories are now searchable by location and hashtags. That means that potentially anyone looking for a particular hasthag or location can come across your Instagram stories! Once you’ve published your Instagram poll, your audience can immediately start voting and see real-time results. Right after voting on your poll, it’s also possible to see which choice is on top at any given moment. Since the reason of the Instagram polls is to see how your audience is responding you need to check the results! To see your Instagram poll results, swipe up to open the viewers list for each part of your Instagram story. You will actually see how many votes each option received, who voted and what option they chose. But be aware that, just like your story, your poll and its results will disappear after 24 hours from posting. 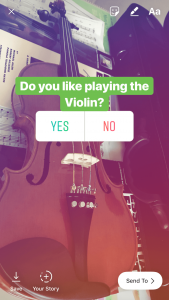 Have you tried out Instagram polls for your business yet? Let us know how they worked out for you!